I'm back to announce our March OCS challenge winner. This month we set a new record with 293 entries!!! Thank you so much for sharing your talent's with us. We love looking at your creations. As usual we used random.org to choose a winner. The winner will win a High Hopes Stamp prize pack. #16 which is Shelley from Shelley's Handmade cards!!! Please email Lora at (lora at onecrazystamper dot com) to claim your prize. Please put MARCH CHALLENGE WINNER in your email subject. Please check back tomorrow for a new monthly challenge and another chance at a fabulous prize!!! Happy Easter to all you crafty peeps out there! Being an avid reader, I have finally decided to make a bookmark for myself. The stamp I used is Queenie and Princess, but fussy cut out the queen and only used that portion. I glittered her crown and added glossy accents to accentuate the jewels. I recently picked up some fun brads from the OCS store that are glasses, I carefully made incisions on queens face and fitted her with the spectacles(Yup, this queen is a bookworm!). For my tassel I used a large vintage brass flower and added a large black bead to the center of it. I love it, and I hope you do too! And hey! There is still a wee bit of time to enter our "Anything Goes" challenge. Hello! Happy Friday and HAPPY EASTER!!!! I know today you would expect me to show you an Easter card, but instead I am here to show you a special Birthday card I made for my Friend David. Once I saw this High Hopes image I knew I had to get it and make a card for David - it is soooo perfect for him! Have a wonderful Easter and please come back on Monday when we will have a new Challenge starting. Good Morning. 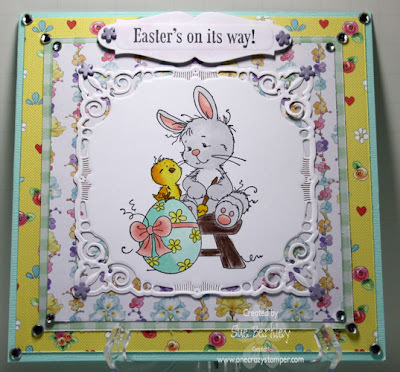 Easter is fast approaching and I usually do not do cards but since this is my grandson's first Easter I thought it would be nice to have a card for him. I have used a High Hopes Stamp for both the image and the sentiment. Thanks for coming by today. Don't forget there are just a few more days to enter our "Anything Goes" challenge for the month of March. We have lots of talent showcased in all our entries. As usual I have colored the image with Copics, then matted it with a beautiful bronze paper from my stash. The dp is from Kaisercraft's Forget Me Not collection, and the flowers, punches, and ribbon are all from my stash. All of the flowers sparkle with a coat of Stickles Stardust. You still have a couple of days to enter the Anything Goes challenge here at One Crazy Stamper, just click on the icon at the top of this blog for full details. Our March Guest designer Emma H has a super cute card to show us today! Just in time for Easter, she has used this adorable High Hopes bunny. I love the cute papers Emma has used on her card and the layout! Thanks for joining us this month Emma! Don't forget you have a few more days to enter our OCS March Challenge. For more info on her card, stop by Emma's blog! Sunday has come again and in a week's time it will be Easter. 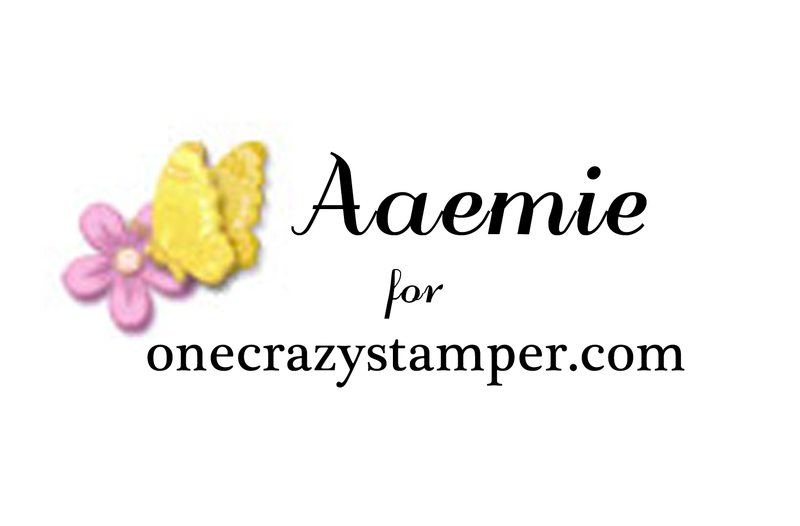 For my post today, I have used this adorable Wee Stamp from Whimsy Stamps. 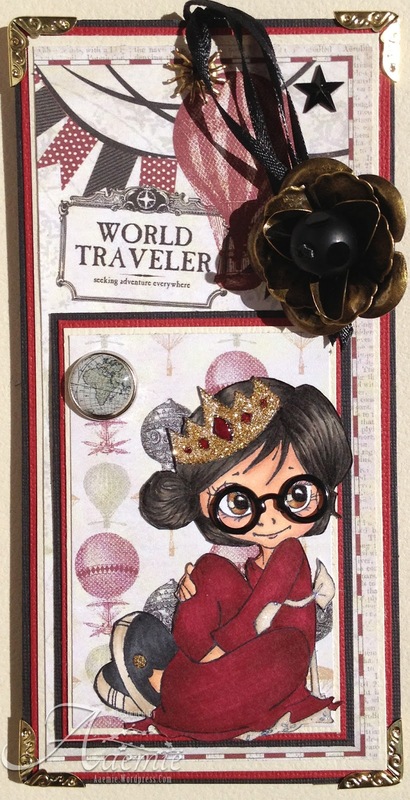 There are still a few days left to create a project and enter this month's "Anything Goes" challenge here at One Crazy Stamper. While you creating check out Lora's store for some great new products. Until next time, keep crafting and have fun! Have a wonderful weekend and come join the fun at One Crazy Stamper, our "Anything Goes" challenge is still going on! Hello again, and Happy Friday! 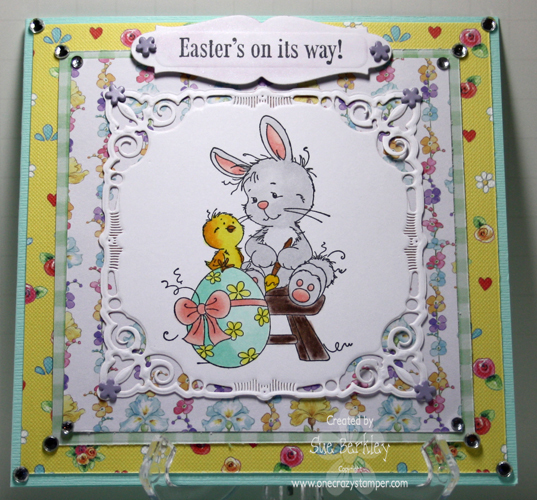 Today's card that I made to show to you is an Easter card I made for my Hubby using Whimsy Stamps Fluffy Bunny by Meljens Stamps. If you would like to see the inside ofmy card and further details, please pop on over to my blog to check it out. You still have just over a week to enter into our Anything Goes Challenge for your chance to win a High Hopes Stamp Prize Pack. Thanks for stopping by and pop on over to the challenge blog and the store some great sales happening!! Good morning. Today is the first day of Spring. Does it feel like it where you are? Not for us, we are still experiencing cold and snowy weather. I honestly do not mind but I know there is a lot of complaining about it going on around me. The card I have to show you today is cheerful and happy like Spring and not a snowflake in sight. It features a Whimsy Stamp by artist Elizabeth Bell. Enjoy your day no matter what you are doing this first day of Spring. Thanks for stopping by and don't forget about our "Anything Goes" challenge for the month of March. You still have time to enter. Tomorrow is the first day of spring, so to celebrate the return of the nicer weather, and the glorious anticipation of flowers I made this bright, cheerful easel card. 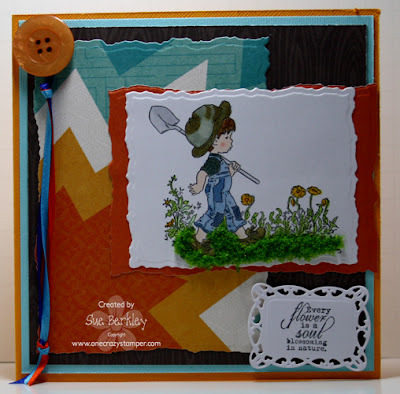 This is Bella Sole Collecting Daisies from Whimsy Stamps artist Elizabeth Bell. I have stamped the image on Copic Xpress It cardstock with Memento Tuxedo Black ink, then colored it with Copics. The image was cut and matted with Spellbinders Label 14, and popped up on the card base that was cut with a Spellbinder Grand Label Four die. The greenery was cut with both a Memory Box Leafy Branch die, and a Memory Box Madera Corner die, cut apart and layered. The interior of the easel card features a Spellbinder Tag die with a birthday sentiment, and flowers punched out of yellow vellum. All of the flower centers are made with the Viva Decor Dark Brown Pearl Pen. There are still several days left to create a project to enter the challenge here at One Crazy Stamper - the theme is Anything Goes!! Happy Monday! 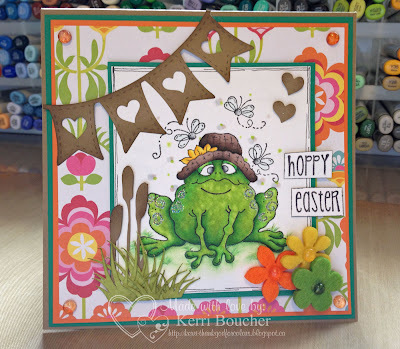 I’m here today to show you my One Crazy Stamper DT post. I’ve used some really great papers and paired them with this MFT stamp. One of my favorite things about MFT stamps is the matching sentiments. I hate trying to find a sentiment to match my image and not having one available, so MFT makes it easy for me. You still have plenty of time to join in the OCS monthly challenge and there is a great prize up for grabs this month! The theme is “anything goes”, so what are you waiting for?! Thanks for stopping by and taking a peek. Another busy week has passed and welcome again to my Sunday post here at One Crazy Stamper. I have used another adorable stamp from Stampavie called Finn Whistling While He Works. 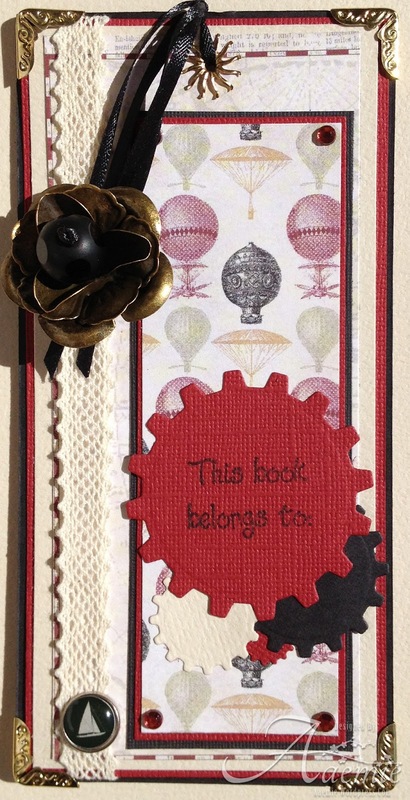 There is still plenty of time to enter our "Anything Goes" challenge for a chance to win a set of High Hopes stamps. Click on the icon at the top of the page for all the details. 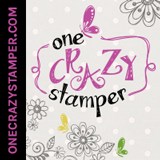 Also check out Lora's store One Crazy Stamper, as some amazing new products are arriving daily. Hey crafty peeps! I hope everyone is having a super duper day, after all it is the weekend. I am looking forward to getting my hair did and catching up on some crafting. I'm also hoping to get one of the kids rooms painted, its on a long list of things to do. 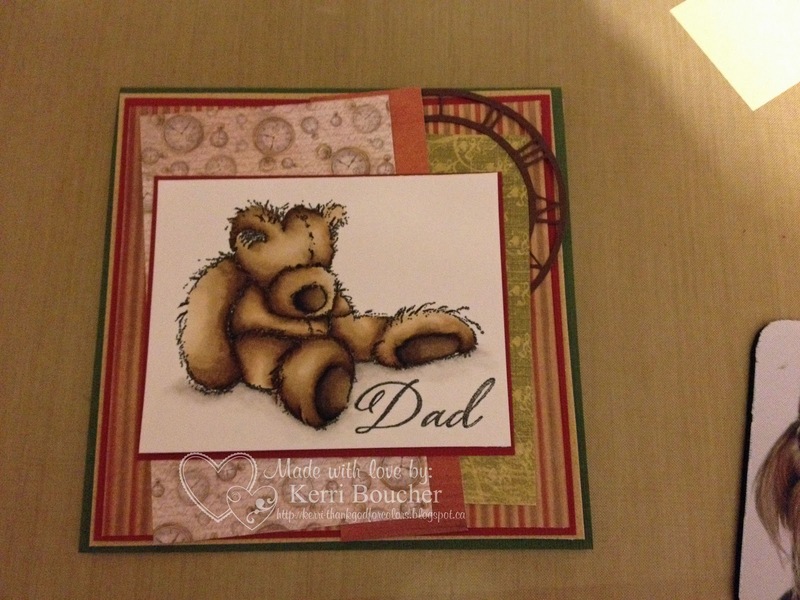 And now here's my card, this was made with someone in mind who is going through a difficult time. I didn't use any copics here, but I did emboss the large sentiment. I finally had a chance to use some of my new spellbinders, so so pretty they are. I even added some stitching with regular thread I had kicking around. 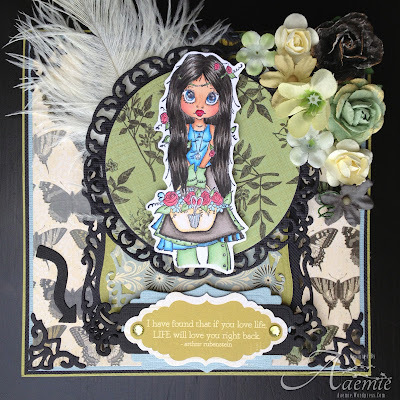 I used two of Whimsy's ticket die stamps(which I cant get enough of) and a prima flower I dug out of my stash. 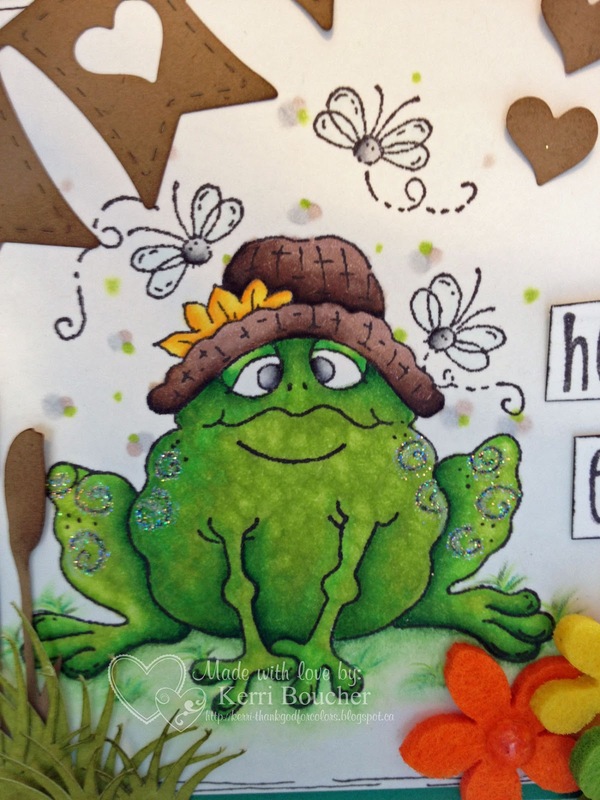 Our "Anything Goes" challenge on the One Crazy Stamper Blog is off with a bang, don't forget to enter all your lovely creations for a chance to some High Hopes stamps!!! Need a Tissue and a Free Hug? Well it is Friday again (YEAH!!!) and that means it is my turn to show you my project for the week! COPIC COLOURS USED: *Skin: E11, E00, E000 *Hair: E49, E59, E25, E50 *Eyes: B01, B000 *Lips: R22, R21 *Bows: B16, B14, B12 *Shirt: B02, B01, B000 *Pants: E42, E41, E40 *Papers: C3, C1, C0, 0. So what do you think? See, I can make other things than cards, LOL. If you would like to see what I did to the back of the tissue box please feel free to pop over to my blog and check it out! Until Next Time, Keep Craftin! 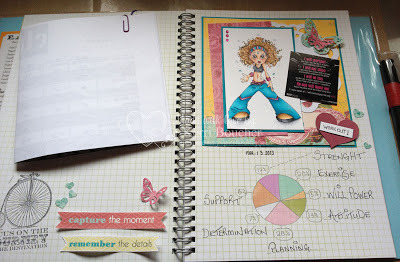 For this Thursday I decided to do a Smash Book page..The image I used is ZUMBA CHICK from SC.. I coloured her with COPICS and shaded her with PRISMA PENCILS...The image was stamped with MEMENTO TUXEDO BLACK on white CARD STOCK..This Smash book is dedicated to my Journey..The Butterflies are done with MARTHA STEWART PUNCHES.. Here is a closer look I hope you like her and all of my Supplies can be purchased at ONE CRAZY STAMPER..
Hi y'all and happy Wednesday. My turn to post a project here using a stamp once again from High Hopes called Penguin Pals. These little cuties are adorable and there are other animals like them as well. Glad you could come by today. Don't forget about our "Anything Goes" challenge this month. You could win some High Hopes stamps of your own just in time for Easter. Welcome back to my Tuesday post here at One Crazy Stamper, and this week I am once again featuring a geek, but unlike the boy computer geek that I featured a couple of weeks ago, this time I have a geekie girl! 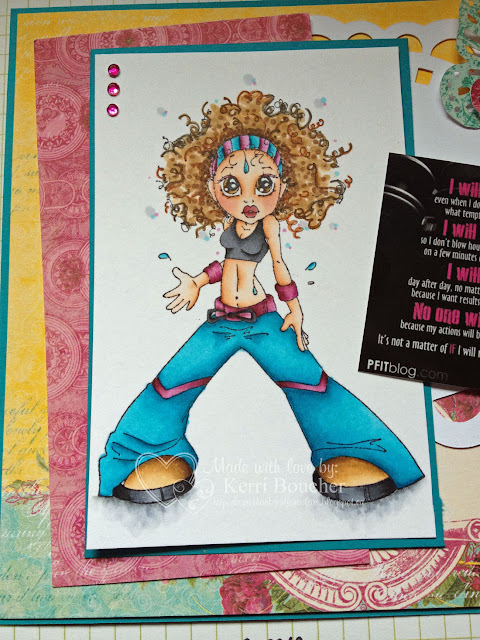 There is still lots of time to enter to win a fabulous set of stamps from One Crazy Stamper, just by entering your Anything Goes project in this month's challenge. Just click on the icon at the top of this blog to get all of the details. I have long admired Saturated Canary images and I even own a few digital ones but this is my first Rubber SC stamp! I love him, he’s named Suspenders. He reminds me of my little guy. I colored him with my copics and paired him with some cute papers from the OCS store! Just in case you missed it there is a ANYTHING GOES challenge going on all month at OCS! Hope you’ll stop by and join in the fun for a chance at a sweet prize! Thanks for stopping by today! Sunday has rolled around again, and now that the clocks have been turned forward an hour, spring will no doubt be here in a few weeks, and the animals will be awakening from their hibernation and start playing. 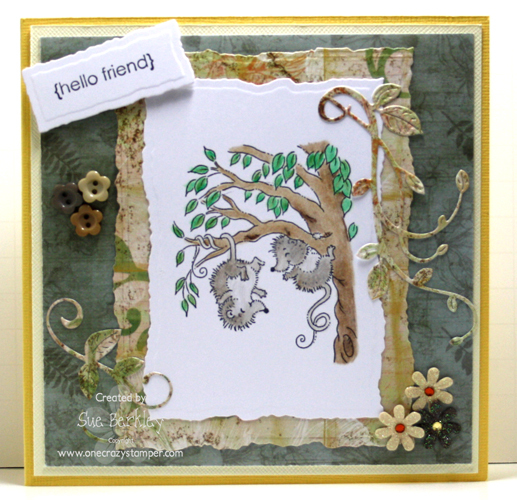 For my card today for One Crazy Stamper, I have used this cute stamp from Stampavie called Opossum Pals. I used Copic Markers on the Opossums and added shading using Prisma Colour Pencils. The tree and leaves were done using only Prisma Colour Pencils. There is plenty of time to enter this month's challenge which is "Anything Goes". Lora's store One Crazy Stamper, has everything that you need as well as some amazing sales.